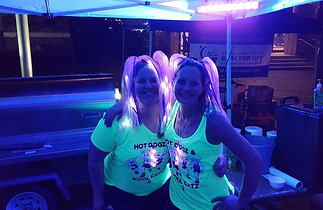 Nicole Borden, underwriting account manager for Bellingham, not only participated in Whatcom County Relay for Life, she is also on the steering committee and headed the luminaria event. 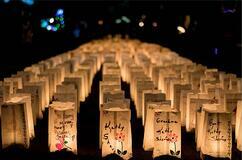 Relay for Life raises funds for the American Cancer Society. 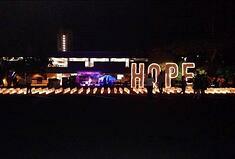 A Survivor Lap opened the weekend event in early July, followed by an all-night walk to raise cancer-fighting funds. Here’s Nicole and a friend in the middle of the night at their Hot Dogz & Cool Katz camp site. Nicole, left, and friend at the all-night walk. 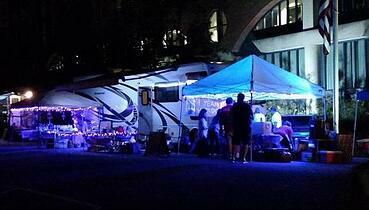 Their Hot Dogz & Cool Katz campsite all lit up. Nicole organized the luminarias on Saturday night for the luminaria ceremony that started at 11 p.m. and just barely ended before the rain began. (See before and after photos, below.) 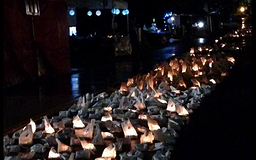 As you can see in the middle photo, each luminaria represents a person who has cancer, or either had it or lost the fight to cancer. Great job, Nicole, those long hours no doubt paid off!